UNITED NATIONS, Nov 13 2017 (IPS) - A vibrant global campaign to ban the use of mercury in dentistry is shifting direction: moving from Europe to the developing world. 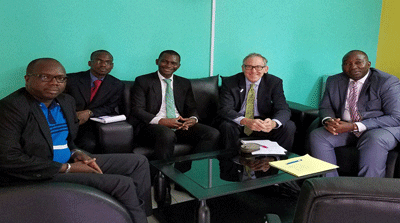 President of World Alliance for Mercury-Free Dentistry, Charlie Brown (2nd right), Dominique Bally (centre) at a meeting during Charlie Brown’s visit to West Africa. Billed as the Conference of Parties (COP1), the Geneva meeting was a gathering of signatories and ratifiers of the Minamata Convention, a legally-binding landmark treaty aimed at protecting “human health and the environment” from mercury releases. The treaty, described as the first new environmental agreement in over a decade and which entered into force August 16, has been signed by 128 of the 193 UN member states and ratified by 84 countries, which are now legally obliged to comply with its provisions. In his opening statement to the plenary session of COP1, he cited major progress phasing down amalgam in nations across Africa and Asia. Immediately after COP1, the World Alliance intensified its Africa campaign. “I went to five nations in West Africa and Central Africa: Côte d’Ivoire, Togo, Bénin, Cameroon, and Nigeria,” Brown told IPS. In Geneva, the World Alliance fielded a talented team from across the globe, including a coalition of environmental, dental, and consumer non-governmental organisations (NGOs) – each with a record of major achievements in its home country. The progress in Africa was described as exceptional. Nigeria, being the economic and population colossus of Africa, got the attention it deserves, said Brown. The World Alliance for Mercury-Free Dentistry, working with the NGO SEDI of Benin City, Nigeria, held a workshop for Edo State in the South-South region. The workshop concluded with the Edo State Stakeholder Resolution calling for amalgam use to cease in Edo State, Nigeria, on 1 July 2018—specifically for children under 16, for pregnant women, and for nursing mothers. Other recommendations include “updating dental schools training curriculum to emphasize mercury-free dentistry and implementation of a phase down work plan. This must also include legislative review and development of guidelines, gathering baseline data and developing the national overview”. The participants also called for an urgent need for Nigeria to domesticate the Minamata Convention as soon as possible. The meeting in Nigeria also declared that “mercury is a chemical of global concern owing to its long range atmospheric transport, its persistence in the environment once anthropogenically introduced and its ability to bio-accumulate in ecosystems. Leslie Adogame of the NGO SRADev, Lagos, pointed to the paradigm shift at Nigerian dental colleges. The English-language daily, the Guardian of Nigeria, reported that stakeholders from the health sector, media, civil societies, called on governments at all levels to end the use of dental amalgam, a liquid mercury and metal alloy mixture used to fill cavities caused by tooth decay in children under 16 years, regnant and breast feeding women. The chemical is said to be injurious to health. They therefore advocated that this should become a government policy that should take effect from July 1 2018. The decision was reached at a stakeholders workshop on phase down of dental amalgam organised by the Sustainable Environment Development Initiative (SEDl), where its Executive Director, Tom Aneni, said exposure to mercury could harm the brain, heart, kidneys, lungs, cardiovascular and immune systems in women, unborn children and infants. Meanwhile, Cameroon has been witnessing significant changes towards mercury-free dentistry not only in cities like Yaoundé but in more rural areas too, such as the Far North Region. Dominique Bally of the African Center for Environmental Health took Brown through three francophone West African nations: Côte d’Ivoire, Togo, and Bénin, where they had meetings with top officials of the three environmental ministries, toured dental colleges, consulted with a top military dentist, and met with NGO leaders. Bally said, “To donate, sell, or otherwise bring amalgam to Africa is not helping the people of our region – it is dumping a neurotoxin into our environment and our bodies. Africans are tired to see their continent being seen as the world dumping site”. The World Alliance President, together with the President of the African Centre for Environmental Health, Dominique Bally, an Ivoirian, are partnering with environmental NGOs, Les Amis de la Terre in Togo and with GAPROFFA in Benin. While delivering his opening speech at COP 1, Brown saluted the work of the Africa region and of the African governments in the march toward mercury-free dentistry. Meanwhile, the Minamata Convention holds critical obligations for all 84 State Parties to ban new primary mercury mines while phasing out existing ones and also includes a ban on many common products and processes using mercury, measures to control releases, and a requirement for national plans to reduce mercury in artisanal and small-scale gold mining. In addition, it seeks to reduce trade, promote sound storage of mercury and its disposal, address contaminated sites and reduce exposure from this dangerous neurotoxin. Yes i agree. I remember i had some patients who’s allergic to mercury. I read an article https://www.dentalhygienist.education/dental-hygienist-career-employment-outlook/ and its our job as a dentist to see if any of drugs we will use will not affect our patients.